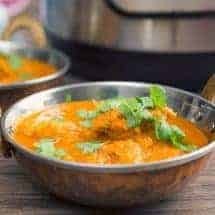 Make an authentic Chicken Vindaloo in your Instant Pot or Pressure cooker, in minutes rather than hours. 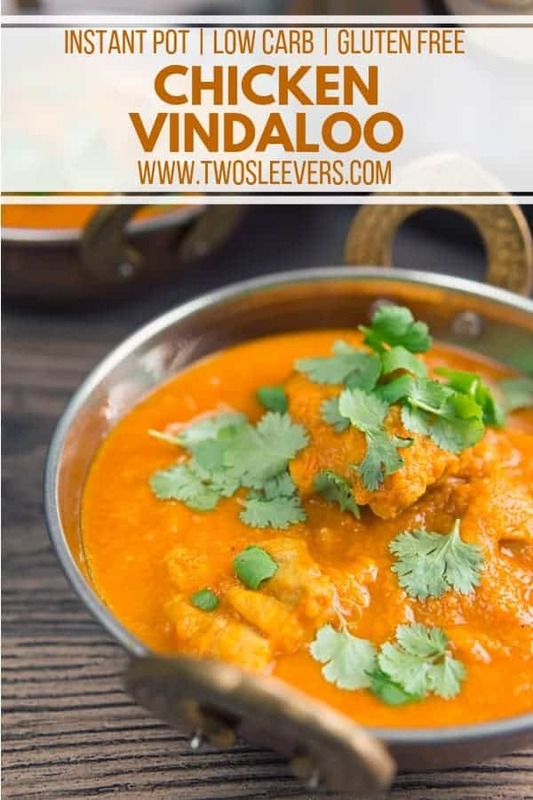 Check out this Chicken Vindaloo Recipe for an authentic vindaloo, made from scratch less than an hour, with no spice pastes. 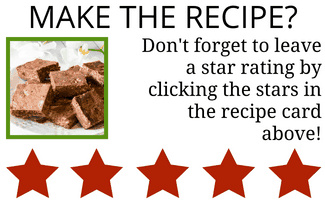 Once you try this, you will be able to make pork vindaloo or beef vindaloo as well, using this basic recipe. Vindaloo comes from India–via Portugal. The story goes that this is how the Portuguese soldiers who came into Goa preserved meat. Typically, they used wine or wine vinegar, garlic and chilis, all of which help preserve meat in hot climates. So “carne de vinha d’alhos” got distorted to Vindaloo and now the world has a great, spicy, piquant dish that you can make to burn off the roof of your mouth. Which is the beauty of a homemade Vindaloo. You can adjust the heat to your liking. Personally, I like heat to be in balance with other flavors. 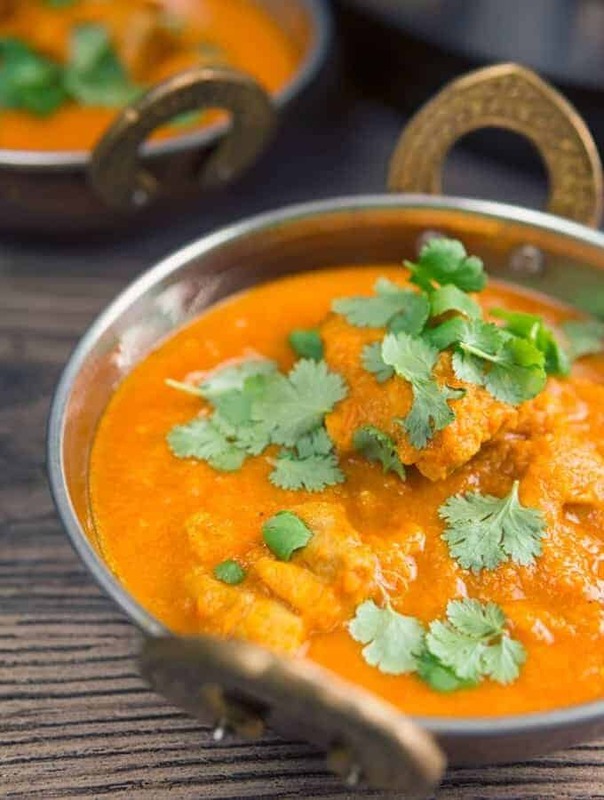 In this Chicken Vindaloo recipe, you should taste spice, heat, and a hint of tartness in the back. All the flavors should be in balance, without one taking over another. The main issue with making chicken vindaloo is you have to brown aromatics first and then grind them together, and I wanted a way to not have to do that. Not only does it take a while, but your house also smells of the browning and I don’t always love that. So I used a hack. What worked for me was to use a paper bowl in the microwave for some of this prep work. Not only did this reduce the dishes I had to wash, but my pressure cooker was also free for other things while the aromatics cooked. So a couple of warnings. Vindaloo is meant to be spicy. You may want to adjust the cayenne pepper to suit your taste. WHAT DOES VINDALOO TASTE LIKE? I know people think every vindaloo has to be” blow the roof of your head off” spicy, but that’s not actually true. In the old days, people used a lot of cayenne, not just as a taste preference, but also because it helped preserve the meat. Do you live in the old days? You do not. Therefore, you do not need to make Vindaloo super spicy–unless you WANT to. It’s the same story with the vinegar. An erstwhile preservative, now you can adjust it according to your taste preferences. WILL THIS TASTE EXACTLY LIKE THE RESTAURANT VINDALOO? THE ONE FROM MY NEIGHBOURHOOD RESTAURANT? I mean, unless you live next door to me and I make it for you, it’s unlikely it will taste EXACTLY like that. How many different ways are there to make chicken soup? That’s probably how many different ways there are to make Chicken Vindaloo. Also, this may not be like the super-thick restaurant sauces which are created with filler vegetables. It makes a thinner, more flavorful sauce than what you may have been served at restaurants, but this is actually a more authentic version. If you want a thicker version, I’d actually add a few potatoes chopped small, which can then disintegrate into the sauce once lightly mashed. Do not use cornstarch! Not only is that not traditional, but it is also less flavorful than a chicken vindaloo thickened with potatoes or other cooked vegetables. HOW DO I MAKE A LAMB VINDALOO? OR A PORK VINDALOO? So for a lamb vindaloo, I would suggest cubing leg of lamb. Those cubes will cook under pressure in about 10 minutes, with 10 minutes of natural pressure release. Then, release all remaining pressure. For a pork vindaloo, use cubed pork shoulder. Once again, if you make bite-size cubes, you should cook under pressure in about 10 minutes, with 10 minutes of natural pressure release. Then, release all remaining pressure. 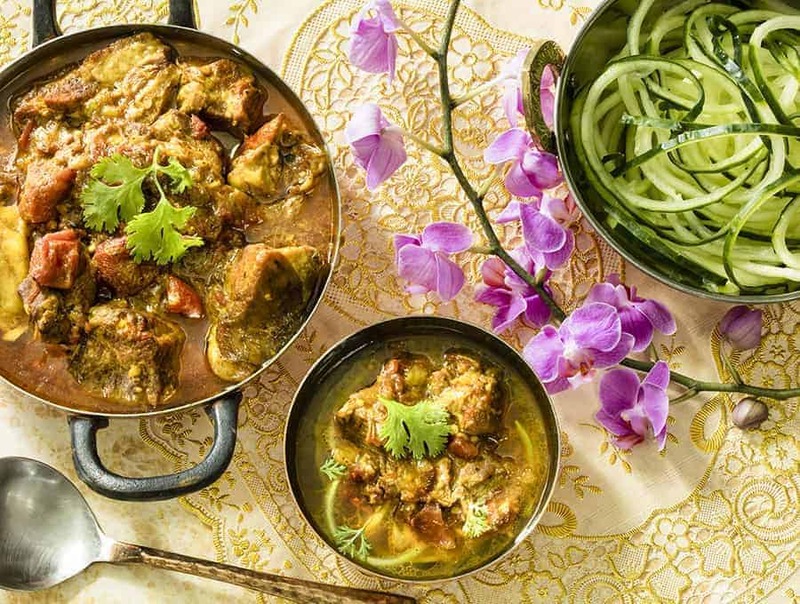 Looking for more authentic Indian recipes? 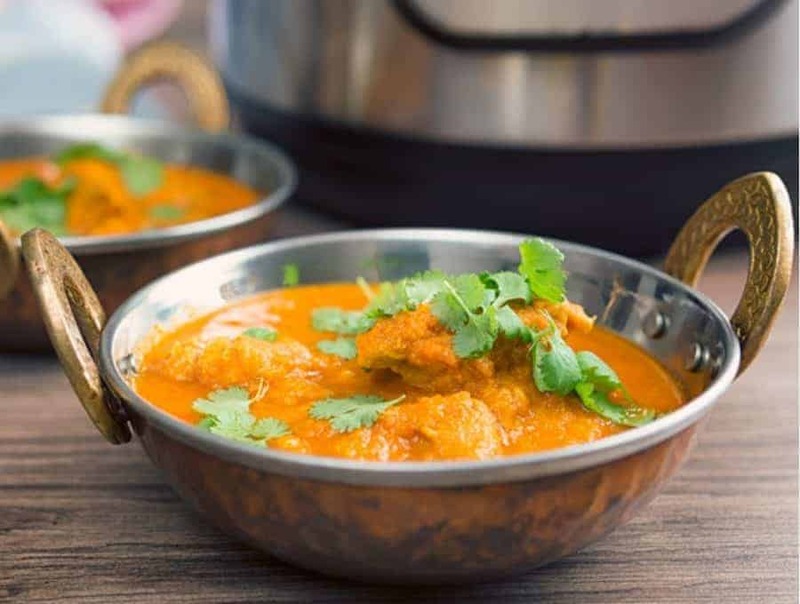 Check out my Basic Indian Curry recipe! This recipe is a savory Indian comfort food that you’re sure to love! 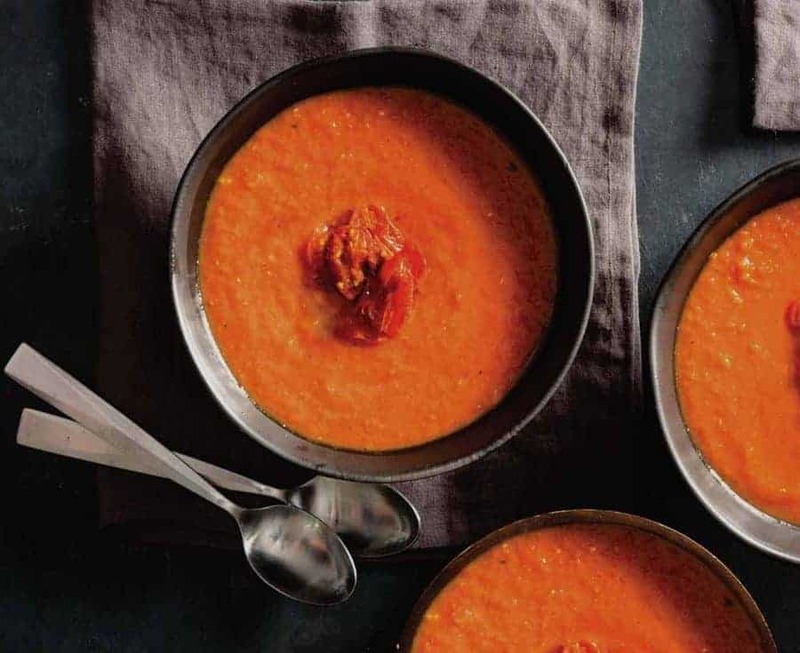 Another great Indian dish is my Pressure Cooker Indian Coconut Tomato Soup. It’s warming, comforting, spicy and absolutely delicious! 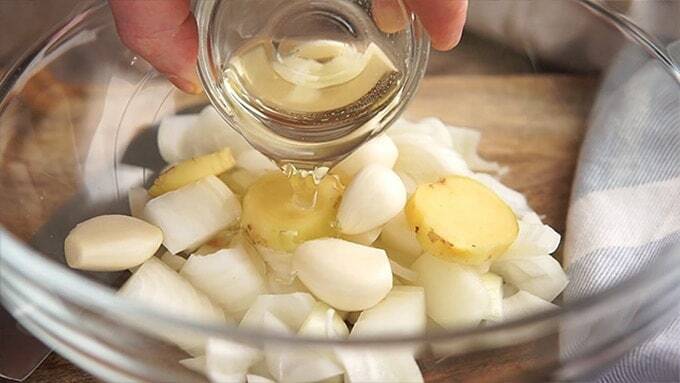 Heat the onions, garlic, ginger and oil in the microwave until the vegetables are browned on the edges. Add paste to chicken and mix until well coated. 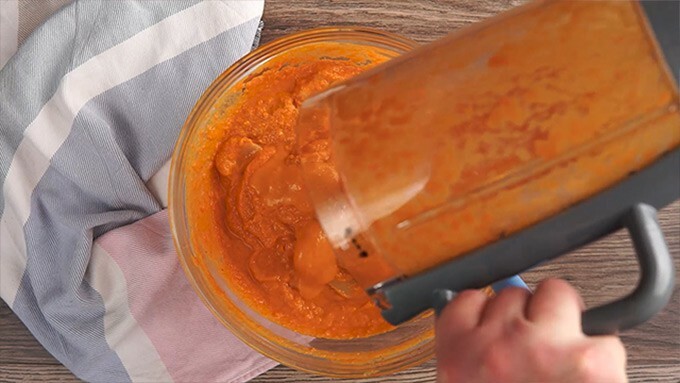 Blend all ingredients except turmeric, water and chicken to a smooth paste. 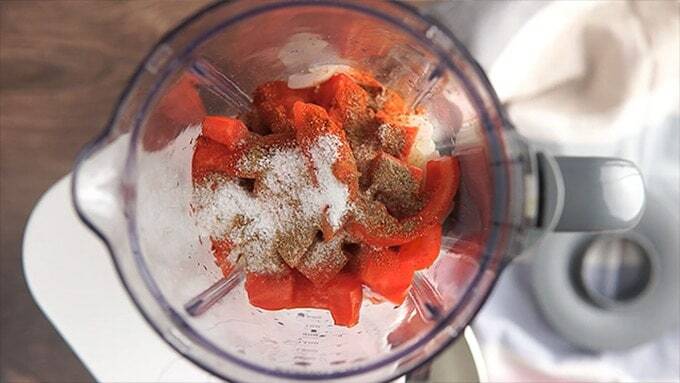 Clean blender with 1/4 cup water and add to chicken. Mix until well incorporated. Cook at high pressure for 5 minutes. Allow pressure to release naturally for 10 minutes then release remaining pressure. In a large microwave safe bowl, heat the onions, garlic, ginger and oil for 5 -7 minutes until the vegetables are browned on the edges. 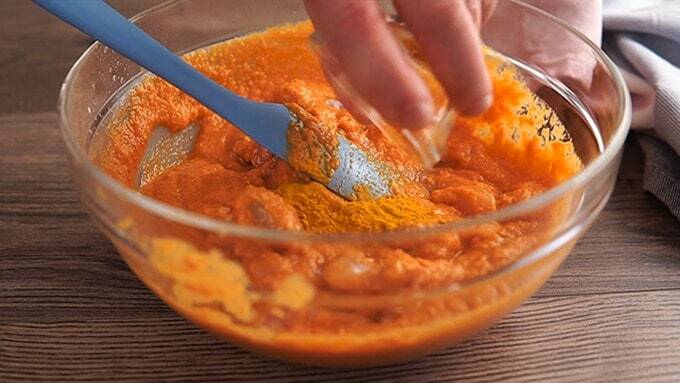 Pour this into a blender and combine with all other ingredients except turmeric, water and chicken. Blend this to a smooth paste. Place chicken in the bowl you used earlier, and pour the spice and vegetable mix it, mixing well to coat the chicken. Wash out the blender bowl with the 1/4 cup water and pour that over the chicken as well. Add turmeric now (adding it earlier could stain your blender bowl) and marinate for 30 mins to 8 hours. 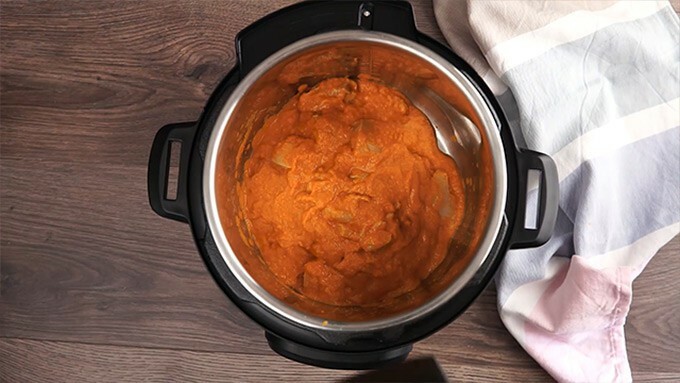 Pour the chicken and marinade into your Instant Pot. 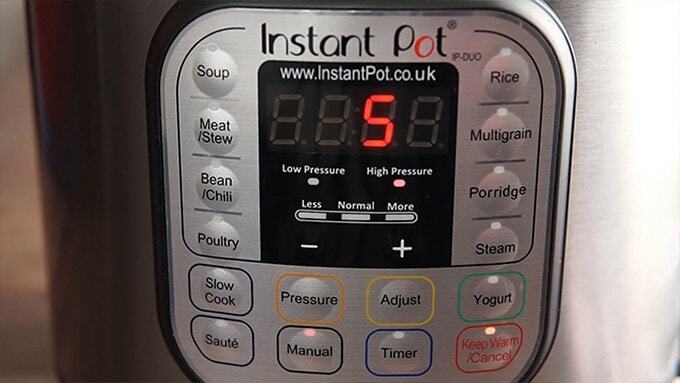 Cook on High Pressure for 5 minutes, and allow the pressure to release naturally for 10 minutes. Release remaining pressure. Depending on your chicken and how much water it releases, you may need to remove the chicken pieces and evaporate some of the water by using the Sauté function to cook the sauce down. 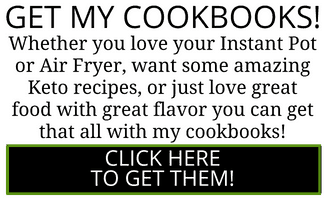 We loooove your cookbooks and recipes and I can’t wait to try this one. How much is the ginger in this? I am unsure on the size of a slice of ginger. This recipe was very easy and quite tasty. I am now sharing with the neighbors, but had to ask: If i’m doubling the chicken to 2 lbs, do we still follow the 5min high pressure, 10 minute natural release? I am using bone in thighs, so i see i increase cook time by a minute or two. Thanks! Keep up the great work! This dish was excellent! We will try this again. You can taste a little acidity but it should be well melded with other flavors not taste only like vinegar. I’m wondering if you accidentally used more vinegar than called for? I used 1/4 cup. I will try again this weekend. 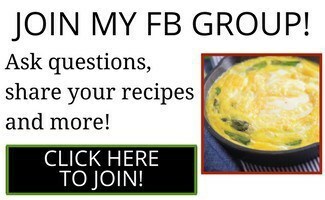 I love every other recipe I have tried from you so i’m Sure I must have made a mistake! Oh my god! My family loved this dish! I forwarded this onto my sister and called her to tell her to make this! Yes!! That makes me so happy!! I tried your fabulous butter chicken recipe tonight. It was quite mild so now we want to make your vindaloo recipe. Question: Can you blend the aromatics with any immersion blender or is it too thick? I find the stick blender so much easier to wash than the regular blender. This was great thank you! Got the thumbs up from the family too! I just ordered your keto book – cant wait! I would like to make this vindaloo with chickpeas instead of chicken. How much should I use (they will be soaked prior) and any adjustments to H20 and cooking time? I made your chicken vindaloo and LOVED it! Cant eat it at a restaurant anymore! Thank you! It’s not a straight swap for chickpeas as they absorb water unlike chicken that releases water. Can this be made with pork if so should I add more cooking time? I may eat the entire pot before my husband gets home tonight. This is SO good. Thank you. Also, I just ordered your Indian cookbook and the Keto cookbook. Looking forward to the inspiration to cook some delicious and healthy meals. I did run into one problem. When it was coming up to pressure my IP gave me a BURN error. I stopped it, quick released the pressure, poured in a half cup of water, and started over. It came up to pressure quickly the second time without the burn error. I only let it release naturally for a few minutes instead of ten to compensate for the extra time it took to re-pressurize, and used the saute mode to remove the extra water afterward. This dish was amazing! There was not a single morsel left over. I doubled the chicken, added a couple of minutes to the cooking time, and thickened the sauce with tomato paste and boiled it down a bit at the end. Served it with roasted cauliflower, butternut squash, peas, brown basmati rice and whole wheat naan. This will be one of my go-to meals! I just made this dish for my husband n he just loved it!! Yes!!! That’s a victory right there!